Join the campaign to tackle negative gender stereotypes and champion diversity. It is estimated that only 25 per cent of people in the science, technology, engineering and mathematics – STEM – sector are women. This a waste of both talent and opportunity. The jobs of the future will require more STEM skills, and Equate Scotland wants women to have equal access to the jobs of the future; doing so is a way of tackling the gender pay gap, occupational segregation and societal inequality. To do this everybody needs to be engaged in the conversation around inclusion and diversity. The jobs of the future are in STEM; it could be researching the next drug to combat cancer, designing the most durable and flexible prosthetics to allow someone to walk again, erecting the next Olympic stadium, creating interactive virtual reality or discovering the next solution in renewable energy. The possibilities in the industry are limitless, but for women the opportunities are limited. Despite boys and girls having an equal interest in science and technology, by the time girls enter their teen years their interest dramatically falls (regardless of the academic capability in science). From the age of 15 young women have potentially limited their chances of working in STEM. This is because they are often stereotyped into making certain choices. For the few girls who do pursue subjects such as physics or chemistry it can be an isolating experience when they are potentially the only girl in the classroom, and it runs the risk of putting them off continuing with that subject. We need girls and boys to see subjects as being “non gendered” and feel able to pursue what interests and excites them. Of the women who do move onto university and qualify in STEM subjects only 27 per cent are likely to remain in the industry. This is a significant brain drain for Scotland. From that 27 per cent, only a handful will make it to senior roles. And many of them will feel that their accomplishments are being overlooked, and many will report stress at balancing careers and caring responsibilities in an inflexible work environment. However, change is on its way. STEM employers are not only aware of the issues but enthusiastic in identifying solutions. A number of initiatives such as women’s networks, placement programmes and mentoring schemes have been created through the help of Equate Scotland, and the issue of women in STEM has never been a higher political or economic priority. Equate Scotland knows that by working with women, with academia and with the STEM industry, we can create a sector which is inclusive and attractive to women. Equate Scotland ise therefore asking women and gender equality champions to take part in #ThisIsWhatASTEMinistLooksLike and post photos of themselves in their STEM environments; a university, a college, an office, a laboratory, a factory or construction site. Equate Scotland wants to promote the idea that diversity in science, technology, engineering and mathematics is not an anomaly, but a shared goal. This campaign is for the thousands of women working, studying and leading in Scotland’s STEM sector; to celebrate their stories, contributions and achievements to enhance the visibility of women these industries. 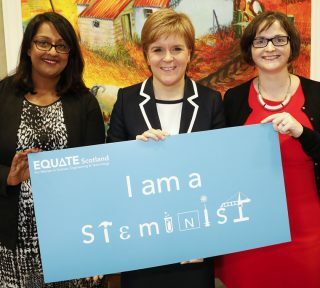 Join the campaign and tell Equate Scotland what a ‘STEMinist’ looks like to you by uploading your photo to social media with the hashtag #ThisIsWhatASTEMinistLooksLike. Those who post a photograph will automatically be submitted into Equate Scotland’s photography awards and the top 10 will be showcased at an event on 27 March in Edinburgh. #ThisIsWhatASTEMinistLooksLike aims to break down existing stereotypes of working in STEM, challenge the treatment of STEM women as anomalies and champion Scotland’s diverse workforce. This campaign is for anyone who supports diversity in the STEM industries. This is for all women who want to inspire others by sharing their story, challenges and achievements. This is for girls who love science, technology, maths and engineering. This is for students studying in a STEM field. This is for men and those who do not identify as women who support the recruitment, retention and progression of women in STEM. This is for employers who understand that without diversity Scotland cannot meet its potential. This is for you and together we can break down gender stereotyping in the workplace. 1 – The image has to include a person. 2 – The image represents diversity in STEM. 3 – The hashtag #ThisIsWhatASteministLooksLike is used. 4 – The image includes a caption, blurb or explanation. 5 – You tag Equate Scotland on Instagram or Twitter – @equatescotland (so they know you have entered). The campaign closes on 8 March, International Women’s Day. The finalists will be announced at a celebratory event on 27 March, in central Edinburgh and photographs included in the campaign will be exhibited on the night. If you don’t have a social media account but still want to join in, email your image and caption to Equate Scotland at info@equatescotland.org.uk and they will post on your behalf. You can download an ‘I am a STEMinist’ poster here.